Joe Swail overcame an arm injury to reach the semi-finals of the Welsh Open in Newport after an epic four-and-a-half hour 5-4 win over Stephen Maguire. Swail enjoyed a two-frame advantage on three occasions but Maguire battled back to force a decisive fifth frame. "It was exciting for the spectators and the audience but it was a very twitchy match," Swail told worldsnooker.com. Ali Carter overcame Shaun Murphy 5-2, Anthony Hamilton saw off Mark Selby 5-3 and Neil Robertson beat Marco Fu 5-2. Selby, the 2008 champion, was handed what was claimed to be a writ before his match against Hamilton, who faces Carter in the last four, and the incident seemed to affect the 25-year-old from Leicester. It was, nonetheless, a fine win for Hamilton after a poor 2008 which saw him slump to 31 in the world rankings and fail to get beyond the last 32 of any major tournament. Hamilton got off to a fine start, moving into a 2-0 lead before world number four Selby clawed his way back to level matters over a pair of lengthy frames prior to the mid-session interval. The pair shared the next two frames before both men had their chances in a marathon frame seven, which at one stage saw a spell of safety play lasting half an hour before Hamilton edged back in front. Hamilton kept cool to establish a 53-1 lead in the next frame but the match still looked set for a decider when Selby came to the table until he missed an easy brown and allowed Hamilton to clinch victory. Carter, meanwhile, continued his excellent form by storming back from losing the first frame of his match against former world champion Shaun Murphy, winning the next four and ultimately cruising to a 5-2 win. Swail had three times enjoyed a two-frame advantage against Maguire - at 2-0, 3-1 and 4-2 - but was made to sweat as the Scot battled back to force a decisive fifth frame. World number 20 Swail scored 43 before missing a pink and then watched as Maguire cleared the remaining reds. It looked as though the escape was on but he then missed the yellow while clearing the colours. Handed a second chance, Maguire missed the green and then watched as Swail potted the brown only for the cue ball to knock in the pink. However, the 39-year-old snookered Maguire on the brown and, after Maguire accidentally potted blue, he swept to a 5-4 victory. 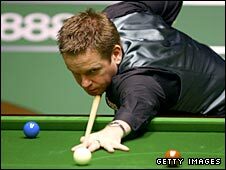 Swail will meet either Robertson in the last four after the Australian comfortably swept past Fu. It was a late finish for the pair, with their match not starting until after 2200 GMT, and Robertson said his nocturnal habits had stood him in good stead. "My sleep pattern over the last five years stood me in good stead tonight, as I tend to sleep in during the mornings and feel alive at this time," said Robertson. "I thought Marco would also keep his focus, but he missed quite a few balls. I went out tonight with a positive attitude and I started strongly. "I'm mega confident now because of the fact that once I've got to a semi-final I've always gone on to win. Selby and Maguire both went out which means I'm the only one left who has won a tournament before. "Joe Swail has never been to a final but that means he will be hungry. He's an attacking player so it should be a good match."